Do you fell annoyance that the cake may destroyed when transport from home to family gathering? Are you feel irritability when cake fall over the ground or the car? Do you want to store goodies in drawer or on shelf? YOU NEED THIS 4-in-1 CAKE SERVER. Our 4-in-1 Cake Server can deliver your sweet creations to a party or bake sale, use the round cake carrier to safely carry birthday cakes and other special occasion cakes or use the dip inserts to keep your crew fed on game days or at tailgates. 1.Choose which tray you want to use. 2.Place tray over the base and be sure to match up the track underneath the tray to the holders around the base. When in correct place the tray will not move. 3.Insert food or baked goods. 4.Place party traveler base on firm surface .Place lid carefully over the base making sure base clips & cover holes are aligned,place both hands on top of cover & firmly push down locking cover to base. 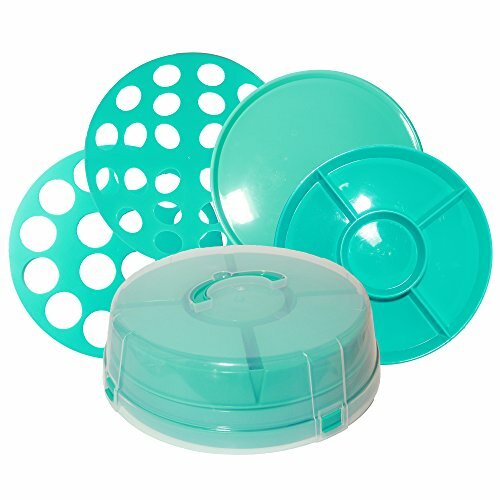 We believe that with the durability, the convenience and the versatility of our DOTERNITY travel cake carrier can make store and transport more easier. Includes 4 different flexible replacement tray. Can display and carry 16 Cupcakes OR 24 Deviled eggs OR 4 Assorted Vegetables or Chips and 1Dip OR Cakes,Cookies Πes at a time. Align Base Clips & Cover Holes and carrying Handle allows easy and convenient and secure transport. Made of 100% BPA Free, durable reinforced PP Plastic. If you have any questions about this product by DOTERNITY, contact us by completing and submitting the form below. If you are looking for a specif part number, please include it with your message.